Sharon M. Sintich, Ph.D. will speak on panel during Northwestern University's Robert R. McCormick's School of Engineering and Applied Science “Biotechnology Day 2014.” The event will take place on October 6, 2014, from 12:45 p.m.–1:45 p.m., at Northwestern's Norris University Center in Evanston, Illinois. Biotechnology Day is a one-day event focusing on emergent issues in the biotechnology industry and celebrating advances in biotechnology training. The program will highlight talent and technology pipelines developing across the University. Northwestern University program participants include the McCormick School of Engineering, Feinberg School of Medicine, Office of STEM Education Partnerships, Research Cores, Graduate School and Northwestern University School of Law. During the panel discussion, Ms. Sintich will provide a personal view on the current challenges to biotechnology commercialization, and will answer questions presented by Esther Barron, Northwestern University's Harry B. Reese Teaching Professor of Law and the Director of the Entrepreneurship Law Center in the Bluhm Legal Clinic. Collectively, the panel will address the rapidly changing ecosystem of biotechnology and pharmaceutical commercialization alliances, the variety of regulatory, legal and economic drivers that impact partnerships, the evolving landscape of biotechnology commercialization, and the challenges and opportunities presented. For more information about the event and to view an agenda, click here. Dr. Sintich combines experience in all aspects of patent prosecution with technical insight gained from her graduate research in tumor cell biology at Northwestern University. 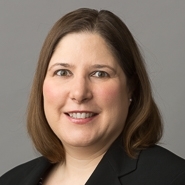 She also counsels clients in portfolio management and provides opinions on patent validity, patent enforceability, and freedom-to-operate issues. Dr. Sintich brings a committed and methodical approach to protecting clients’ innovations in biotechnology, while adding value for their businesses. Marshall, Gerstein & Borun LLP's large Biotechnology Group includes lawyers and patent agents with broad experience in a variety of biotechnology disciplines, including: DNA, RNA, vaccine, protein, and antibody therapeutics and diagnostics; cell-based and viral therapeutics; drug and gene therapy delivery vehicles; plant biotechnology; industrial technology and research platforms; nanotechnology and interdisciplinary inventions. The Firm's professionals are skilled at providing patent counseling relating to the interface between patents, clinical product development, FDA regulations and regulatory exclusivity.